Before I forget, and for those who don't already know, it's Christmas in July time at Ernie (Not Bert). (Wait, it's August! Boy, is Ernie dedicated!) Everyone is wondering how Ernie does it, and that includes me! Meanwhile, over here, some soothing sounds for people having trouble getting to sleep--people like, oh, for example, me. Four superb sides by Paul Whiteman--three of them "concert" treatments of pop songs and the fourth a symphonic jazz piece by Rube Bloom called Soliloquy. These are my own rips from my own 12-inch 78 rpm copies, and I hope I've done the originals some justice. Two of our selections--Lover and I Can't Give You Anything But Love--feature (in my opinion) lovely vocals by Jack Fulton, whose biggest fan has to be Gary Giddins, author of Bing Crosby: A Pocketful of Dreams--The Early Years, 1903-1940. who describes Fulton's singing style as "effeminate" and "almost flaccid," apparently because Jack sang in a (gasp!) falsetto. (What was next? Long hair? Flowery clothes?) I would like Giddins' book a great deal more if he'd managed to present Bing as something new and important (which Bing certainly was) without resorting to insult-a-thons, but the volume is dedicated to hyping Bing as the hero in a sea of backward squares (is that redundant)? In other words, same ol' pop biography. 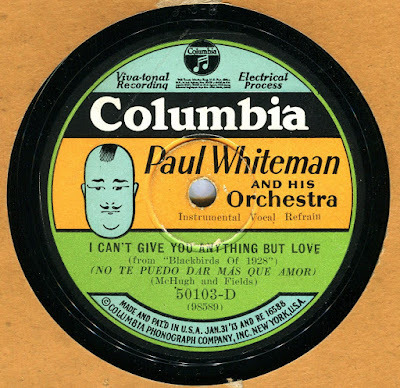 I Can't Give You Anything But Love--Paul Whiteman and His Orch. Just to let everyone know I'm still among the living. More specifically, among the tired. I'm having major sleep issues, but they're slowly working themselves out with the help of prescription meds. It's just that, for some strange reason, I go through the day tired (as I did today), then sit in a chair at 1 am, wired awake. What the heck? This is the pattern I seek to end. Hope everyone's fine. Be very careful next Monday when the solar eclipse occurs. I won't even try protective glasses myself--I'm simply not looking. I'm sure it'll be on TV. Where I live, we won't get the complete blackout effect. Which is fine, since I'm not looking, anyway.